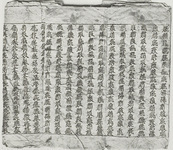 Among the various clues found in Kara-Khoto, it was the manuscripts written using the Western Xia script which were the most decisive in solving the major mysteries of the dynasty. The struggle to decipher those manuscripts also promoted the study of the Western Xia language and its characters. The Western Xia language(15) was invented by Yeli Renrong (野利仁��) and other scholars. The founder of the dynasty, Li Yuanhao (李元昊), issued a decree ordering the invention of an original script for the language as one of the founding projects of his rule. The scholars involved in this project sought to develop a variation of the Chinese characters, in an effort to set their dynasty apart from the Chinese language and its culture ( though it is thought that some Chinese scholars participated in the project). In 1036, the newly-created Western Xia language became the government-designated language. The study of the Western Xia language was launched in France, and it advanced remarkably after Kozlov’s discovery of Khara-Khoto. Kozlov’s findings included dictionaries which became indispensible for the study. These dictionaries included the Western Xia-Chinese bilingual glossary, Bo Han He Shi Zhang Zhong Zhu (蕃�h合�r掌中珠) and the book on Western Xia pronunciation written in Western Xia characters, Tong Yin (同音). Because of the intense desire to translate classical texts into the new language, many translated versions of Chinese or Tibetan Buddhist scriptures and Chinese classics, such as the Analects of Confucius, the Classic of Filial Piety, and Sun Tzu’s Art of War, were found at the site as well. These all proved helpful in understanding the language. Russian scholars Ivanov and Nevsky as well as Chinese scholar Luo Fucheng contributed greatly to the research. Also, the Japanese scholar, Tatsuo Nishida played a vital role in advancing research in the language. According to Nishida, the Western Xia language consists of more than 6,100 characters, most of which are ideograms or, properly speaking, logograms. There are almost no pictographs like the Chinese “山” (mountain) or “川” (river). On the contrary, the Western Xia conveyed concepts through semantic elements, composing individual characters by combining necessary elements. Experts have confirmed that there were 350 elements and 44 methods of combination. While some of the elements for forming the Western Xia characters are similar to Chinese radicals (or classifiers), Western Xia characters can represent different meanings with the same elements by positioning the elements upside down or switching the right side with the left （Elements of “Water” and “Fish”, “Branch” and “Leaf”(16)）[a]. Elements with similar meanings tend to have similar shapes （Radicals indicating “person”, “animal”, and “insect”(17)）[a]. There is also a radical that represents “negative” and cannot be seen in Chinese （“gather” and “disperse”, “forget” and “remember”(18)）[a]. A crown radical changes a noun into a verb （“cloth” and “clothe”, “weapon” and “fight”(19)）[a]. As Western Xia characters were thus formed by combining several semantic elements, its system is rational and well-organized. It is possible to interpret meanings of each character by association. One of the most fascinating points in studying the language is that we can see something of the Western Xia people’s way of thinking through deciphering their characters. For instance, the Chinese characters “�” (a little bell) and “�” (a bell) have a radical which means “metal” and both belong to the category of metal. In contrast, the equivalent Western Xia characters utilize a radical which means “sound” and belong to the category of items of sound production. The Western Xia character which represents “short”(20)[a] has a radical meaning “not yet” and has the other element meaning “reach”, while the Chinese equivalent “短” consists of the parts which mean “an arrow” (矢) and “small one-legged tray” (豆). Another interesting instance is the character which represents “China / Chinese”(21)[a]. The character is composed of the elements meaning “small” and “insect.” This derogatory word symbolizes Western Xia’s sense of rivalry and pride against China, claiming their superiority over it.